Regular visitors to this site will understand how much we LOVE Goldfrapp. This latest album does nothing to change that opinion. Alison & Will take us back to the 80s with a heady blend of hi-NRG basslines, fat synth sounds and feathery vocals. It's easy to see the influences here: Giorgio Moroder, ABBA, ELO, even the Van Halen synths are all present and correct. The featured cut, 'Believer', sounds instantly familiar, but not tired or obvious. If the album seems somewhat slight, it’s purposefully so: Head First is a love letter to the frothy, fleeting, but very vital joys of pop music. 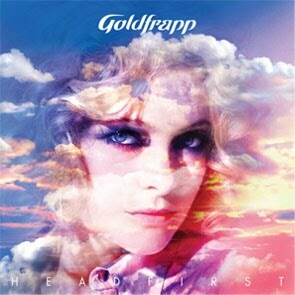 I've missed you Goldfrapp. Nice to have them back doing what they do best. lovely little bit of pop.